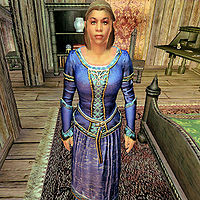 Lyra Rosentia is an Imperial commoner living in Bruma. She is apparently an avid collector of Akaviri artifacts, though you won't hear it from her. Lyra lives a relaxed life in snowy Bruma; She sleeps in her second-floor bedroom every night between midnight and 6am. After waking up she strolls around near her bed until midday, only interrupted by a two-hour breakfast at 8am. At midday, she takes her breakfast until 2pm and then her routine varies; on Tirdas and Turdas she leaves the house for a bit of browsing inside Nord Winds before dinner; on all other days she stays inside her house. At 6pm she always enjoys a two-hour dinner at the Jerall View Inn, then spends the rest of the evening hanging in the taproom. At 10pm she returns home and relaxes on the second floor until her bedtime at midnight. Lyra wears a blue silk shirt, blue silks, and blue suede shoes. She also carries Lyra Rosentia's key and a comparatively large sum of gold. When asked about Bruma, Hafid Hollowleg may state that: "Lyra Rosentia collects Akaviri artifacts. She might have a project in mind. Her house is west of the chapel." However, there is no quest connected to Lyra. Esta página foi modificada pela última vez à(s) 05h03min de 22 de abril de 2014.